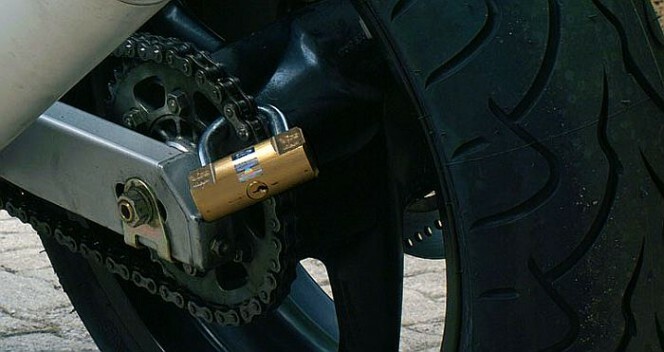 Wouldn’t it be nice if you could protect your motorbike with the same ease as a disc lock but even more securely? There is a way, but despite its effectiveness it is not well known. We are talking about crown locks. Unfortunately, it is only a viable option for motorcycles with a final chain drive. So, it’s not suitable for scooters and motorcycles with drive shafts. But for bikers who ride a motorcycle with a chain, who are without doubt the majority, it can be a valid alternative to the more common disc lock which, as we have seen, can be put out of action in certain contexts in a relatively simple manner. A crown lock is basically a lock which is capable of closing in one of the slots of the transmission crown in order to prevent its rotation. A Viro cylindrical padlock used as a crown lock. 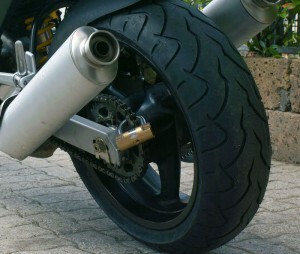 A crown lock therefore performs the same function as a disc lock, as it prevents the motorcycle from being removed by making it “walk” on its own wheels. However, compared with a disc lock, it is much harder to neutralise. Whilst a disc lock can sometimes be put out of action by unscrewing the disc and then starting the vehicle and driving away undisturbed, the same technique does not apply to the crown lock. First of all, in fact, it is generally more difficult to unscrew a transmission crown than to unscrew a disc, possibly on the front wheel. But, above all, even if a potential burglar were able to unscrew the crown from the wheel the engine would run idly and it would not therefore be possible to get away by riding the motorcycle; it would have to be pushed by hand, making the entire operation considerably more complicated. It is fast to put on and remove, just like a disc lock. It is easy to carry because it is small and light enough to be easily housed beneath the seat. It is more secure than a disc lock as it prevents the motorcycle from being removed by driving it. Besides the convenience, there is, unfortunately, another aspect common to disc lock and crown locks. Neither of them allow the motorcycle to be secured to a fixed point and therefore not impede attempted theft by loading the motorcycle on a truck or other vehicle. To protect against this technique, the best solution is to use a padlock and chain, although this is decidedly less convenient to use and it awkward to carry. A blocca catena may be specifically designed for this purpose, such as the Viro Blindato Extreme. 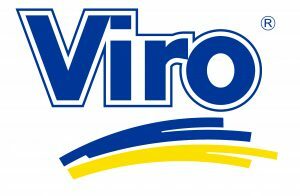 The Viro Armoured Extreme can be used both as a crown lock and as a disc lock. 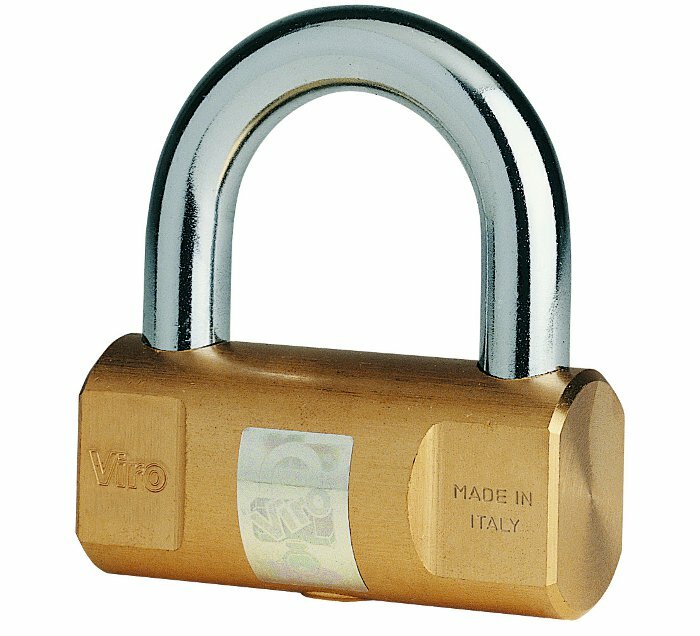 But a padlock with a sufficiently wide shackle can also be used, such as the sturdy Viro cylindrical padlock. A normal padlock can also be used as a crown lock, provided it is of good quality, such as the Viro cylindrical padlock. In the first case, there is obviously a greater protection against possible attacks. 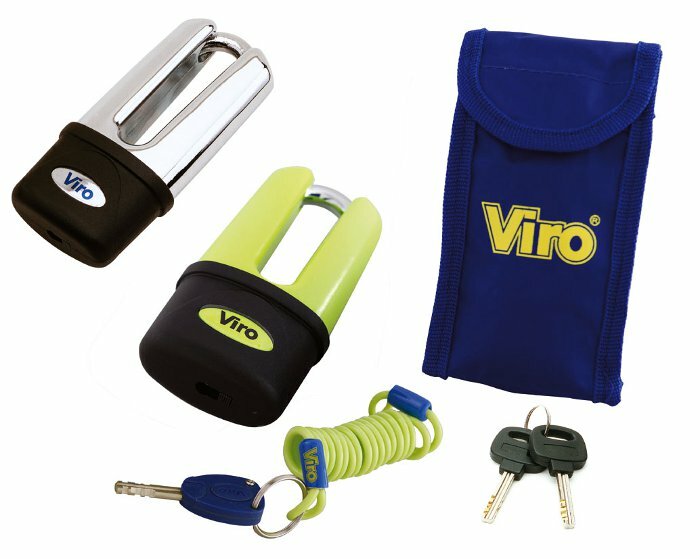 In fact, the Viro Armoured Extreme crown lock has the body and the shackle protected by a thick armour. The lock is also protected by a burglar-resistant plate. In order to achieve even greater comfort and safety, it also comes with a handy nylon pouch, which allows it be carried without ruining the surfaces with which it comes into contact, and a “reminder” cable to be attached to the handlebars when the crown lock ring is fitted, so that one remembers to remove it before riding off, to avoid injury and damage to the bike. Despite the good protection offered by crown locks its use is not widespread. Perhaps the fear of dirtying one’s hands with chain grease adversely affects its popularity. In reality, with a product of the correct size and with a little attention, the risk of getting dirty are minimal and more than offset by the security factor. This entry was posted in Motorbikes and Bicycles and tagged tips on 27 July 2015 by Mara Rossi.